Madison is the state capital of Wisconsin - and the home of the University of Wisconsin. 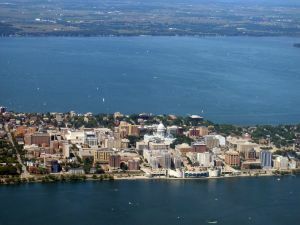 Its downtown is located in the picturesque isthmus between 2 lakes, Lake Mendota and Lake Monona. Madison, the second largest city in Wisconsin, is an exciting university town with rich cultural institutions as well as a beautiful natural environment. Madison boasts a 30-mile web of paved trails that are lit, snowplowed, and biked year-round. Eco-friendly commutes are a dream with walkable streets and great bus service. The downtown is vibrant and warm. Students from the nearby University of Wisconsin (41,000 students) congregate here. 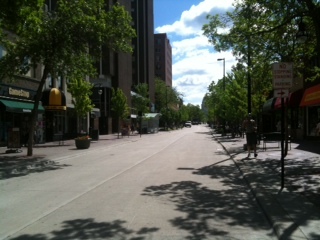 State Street, a car-free zone, links the campus with the capital square. The city has a reputation for its counterculture and liberal points of view, centered in the neighborhood of Mifflin and Bassett streets. During the 70’s the area was referred to as the “People’s Republic of Madison”. Many museums and restaurants now vie for patrons. Many of the city’s important buildings were designed by world famous architects such as Frank Lloyd Wright and Cesar Pelli. This fast-growing city now encompasses several smaller communities: Madison, as well as the villages Maple Bluff and Shorewood Hills, and the city of Monona. The city's boundaries also approach the villages of Verona and Waunakee.